Cas Lowood has inherited an unusual vocation: He kills the dead. So did his father before him, until he was gruesomely murdered by a ghost he sought to kill. Now armed with his father's mysterious and deadly atheme, Cas travels the country with his kitchen-witch mother and their spirit-sniffing cat. They follow legends and local lore, destroy the murderous dead, and keep pesky things like the future and friends at bay. 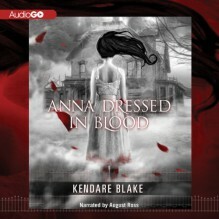 Searching for a ghost the locals call Anna Dressed in Blood, Cas expects the usual: track, hunt, kill. What he finds instead is a girl entangled in curses and rage. She still wears the dress she wore in the day of her brutal murder in 1958: once white, it is now stained red and dripping with blood. Since her death, Anna has killed any and every person who has dared to step into the deserted Victorian she used to call home. Yet she spares Cas's life.